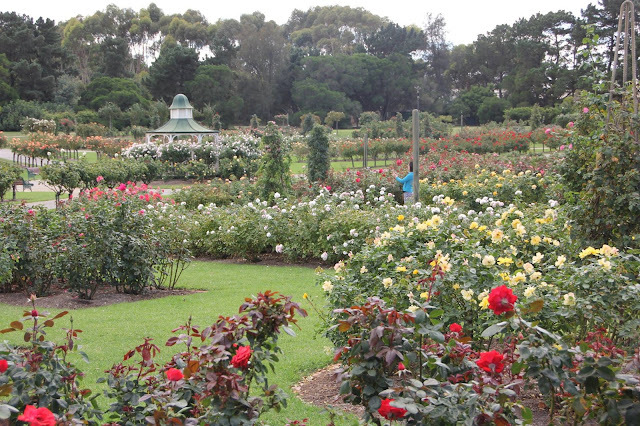 The original concept for a Victoria State Rose Garden came about when Premier Hamer declared Victoria the 'Garden State' in 1976. Mervyn Hayman-Danker assisted the Werribee Park Committee of Management develop a Strategy Plan for the whole 202 hectares site. 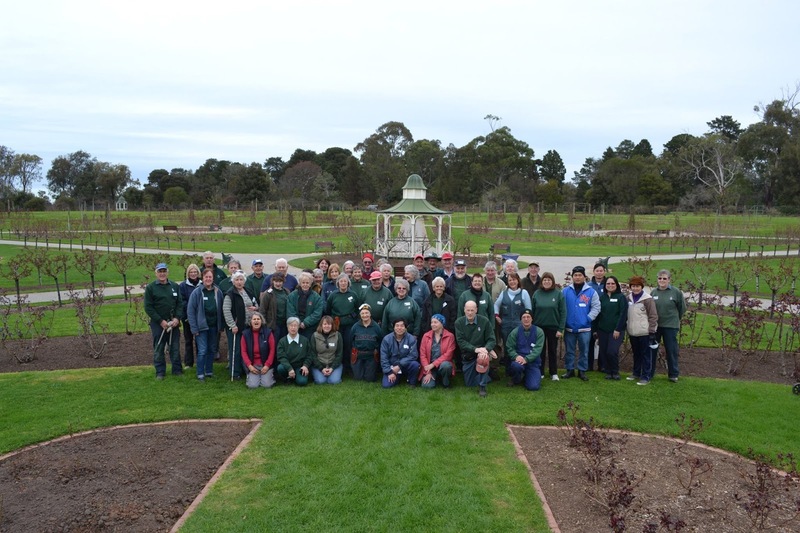 Establishing heritage restoration works to the Chirnside Italinate Mansion, restoration of a Parterre garden and assisted in detailed survey of exotic species and native flora of a ornamental garden designed by Guilfoyle (Designer of the Melbourne Botanic Gardens). Mervyn Hayman-Danker recommended that the Victoria State Rose Garden be located close to the Ornamental Mansion Garden - this was driven by the verve and enthusiasm from the Secretary of the Australian Rose Society, Mr Jim Priestley. With collaboration between these two men, a plan was developed by the Public Works Department to be completed in stages from 1986 until 2001. 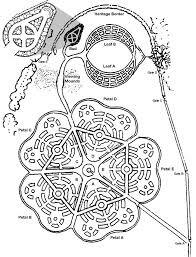 The official opening of stage one - Tudor Rose, Leaf and observation mounds was opened in late 1986. The ten years between conceptual plans and this opening were years of dedicated hard work and lobbying by members of the National Rose Society for it to become a reality. Even though there was a wonderful opening with fantastic weather, this did not mean that the plans went seamlessly from this time! Due to many changes of Government and economic rationalisation it seemed inevitable that the rose garden would fail. In 1992 the gardens were a dreadful mess with overgrown grass, thousands of hips and deadheads. 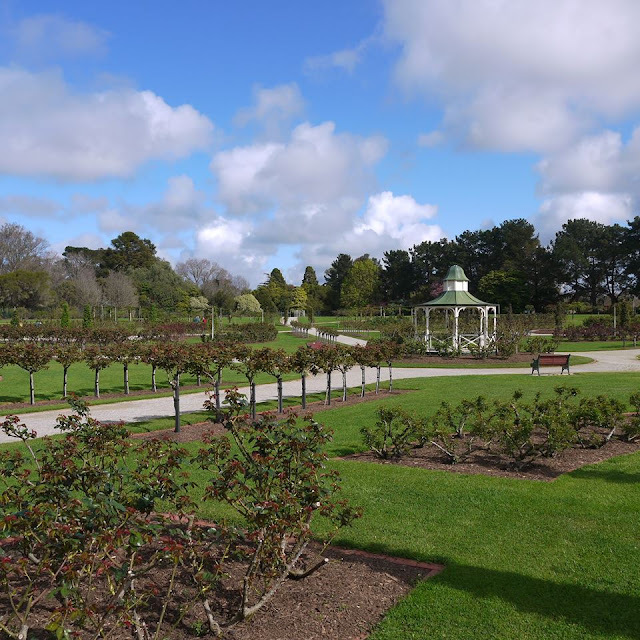 A petition against the demise of the Garden was raised by Jim Priestly which resulted in many hundreds of signatures supporting the Garden and its completion. It had to however, show that there were sufficient volunteers to carry out the work involved in both the current garden and any extension. 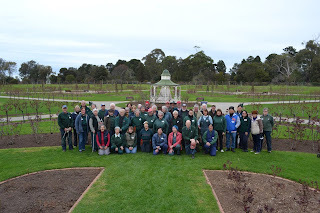 To facilitate this move The Victoria State Rose Garden Supporters Werribee Park Inc. was registered in June 1993 with 50 enrolled volunteers. In 1997 stage one of The Heritage Border was established. This is a hedge of Climbing and Old Roses along the fenceline between the Mansion and the Rose Garden. In 1998 a front row of bush Heritage Roses was planted consisting of 49 varieties - many of these were species roses with historical ties to the modern rose. In 2000 a further 400 metres of Border was planted with Heritage Roses. 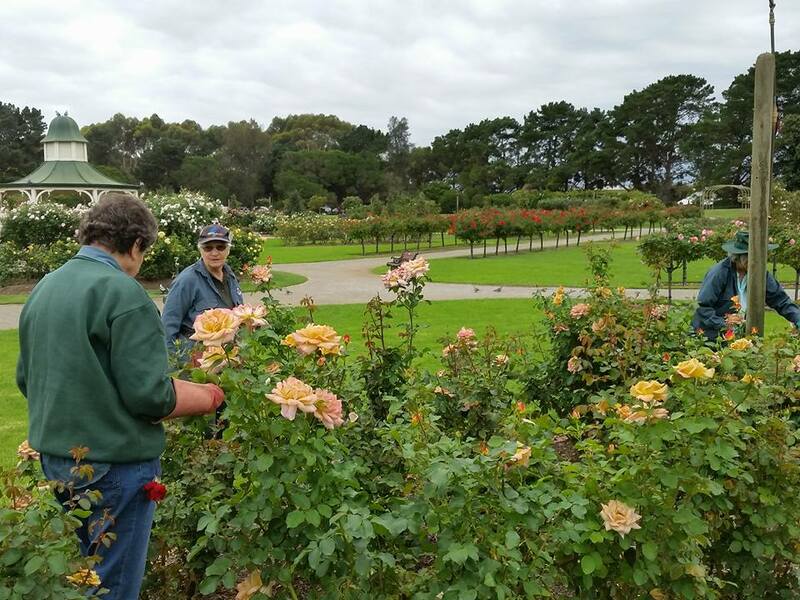 With this inclusion, Victoria now has one of the best collections of Heritage Roses in Australia. Also in 2000, the Supporters were successful in obtaining a grant from the Centenary of Federation to develop and plant a stylised leaf. The Federation Leaf contains 50 beds of Australian bred roses. In addition, eight climbing roses have been planted to climb the watering poles. A donation from David Austin Roses in 2001 enabled the Supporters to plant out 60 varieties of perfumed English roses - both climbing and bush. The garden is in the shape of a rosebud and has been paved to retain a more formal appearance. November 2001 The Federation Leaf was officially opened. 2003 World Federation of Rose Societies granted Victoria State Rose Garden a 'Garden of Excellence' status. 2012 Official Opening of the new archway entrance to the Rose Garden. Today, these gardens are still maintained by the Supporters and there are approximately 100 dedicated supporters. They meet every fine Wednesday of the year to prune, dead-head, mulch, monitor performance, replace roses that are not performing well and anything else that will keep the Garden and surrounds in tip top form. There are usually around 50 volunteers who attend each week and in 2014 they worked 9,777 hours (which does not include administrative time or guided tours), a mighty fine effort. 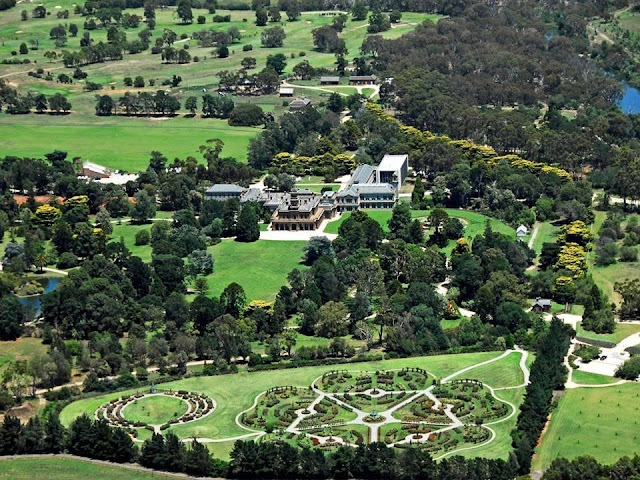 The Garden comes under the control of Parks Victoria and The Mansion at Werribee Park. Their staff assist the Supporters by arranging for lawn-mowing, watering, disease control programs, removal and disposal of garden waste and other tasks in co-operation with the Supporters. A stunning aerial view of the Werribee Park precinct where the Victoria State Rose Garden Tudor Rose design is clearly visible. For more information please check out this link to the VSRG. 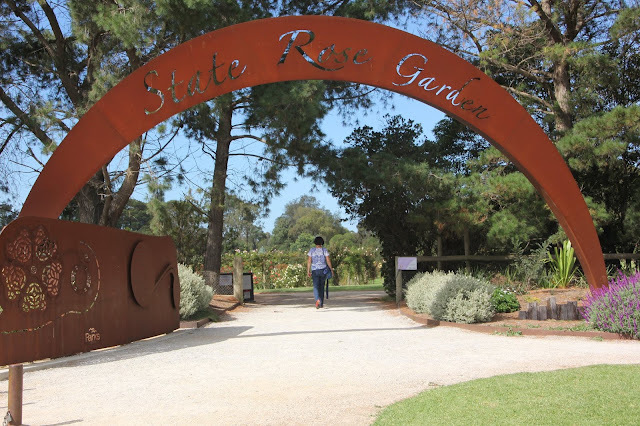 Thank you for the fantastic post on the Victoria State Rose Garden - VSRG! Much appreciated! Your Editor (or Author) has comprehensively covered the History of the VSRG! Well Done! Here is the VSRG Link, if anyone is interested! I hope I can use your aerial view of the Federation Leaf & Bud? Thank you Mervyn. the research for this article was an absolute pleasure. With all my posts for the Coffs Harbour Garden Club website, my main driver is to make them interesting for gardeners and/or relevant for the Coffs Coast. Roses are a passion for me so it was no hardship to trawl through information for this article. I will add a link in this article to the VSRG website. Mervyn, I'm excited to say that we have a visit planned on the morning of Thursday, 1st Feb. Hope to get some good images so I can do a presentation at a Coffs Garden Club meeting. It was fabulous, a perfect day and yes, I have some terrific images destined for a garden club meeting presentation. I found the planting list especially helpful and interesting. The volunteers are to be commended on a job well done - really blows my mind how much work is involved in maintaining such an immense garden. Hopefully one day someone with a drone will take some film flying over the entire garden, now that would be special! The visit more than lived up to our expectations, a wonderful experience and VSRG will certainly see me again. As mentioned to Mervyn Hayman-Danker, to write this post was an absolute pleasure for me. Thanks Maria for you lovely reply and thanks too Mervyn .